Students love to use Clip-It activities during workshop/center time. Students will be engaged with these task cards. 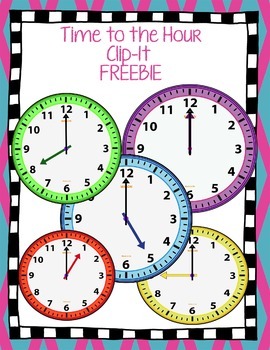 Students can independently practice telling time to the hour. Students will not only develop time and number skills, they will strengthen fine motor skills pinching the clothespins to mark their answers. For learners who cannot use clothespins, a dry erase marker could be used if cards are laminated. To make the cards self checking print the provided answer sheet on the back or use stickers. For extra durability print on card-stock and/or laminate.